On the Sea of Galilee. Still in the boat. God chose this. This tiny stretch of land out of the entire acreage of the world—and a man, then a band of people who grew to great prominence under His care and kingship. Then a scattering for centuries, a dismantling of a nation, yet here it is, back again in the modern world. That the Jewish people and the nation of Israel exist today is a strong testament to God’s unfailing power and word. This very winking moment in history is a remarkable one. In the archaeology, the history of this land, and one of my favorite stories in life, the discovery of the Dead Sea Scrolls, we see ever unfolding evidence that God is still in control of his plan of salvation over this watch in the night that has just gone by. Alright, enough verbiage. You want pictures, I got pictures. Famous ancient port city, built by King Herod around 22 AD. These are the remains of a Roman amphitheater. In I Samuel 31:10-12, the Philistines killed King Saul and his three sons and hung them on the walls of Beit She’an. In Roman times, this became a leading city of the Decapolis. Rich archeological site. Beautiful site where Jesus gave his famous Sermon on the Mount (“Blessed are they who…”). April is always a busy tourist month, but more so this year because it’s the 70th anniversary of Israel’s nationhood. Abraham’s Gate—an amazing archaeological find. This is the gate to the city of Dan, which Abraham would have passed through when he entered Canaan. 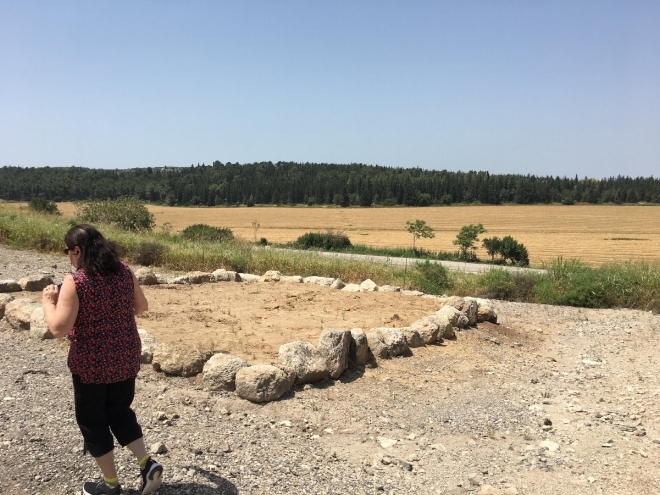 Dan was later the northernmost city in Israel (common Biblical phrase “from Dan to Beersheba,” meaning from north to south), and the site of the Israelites falling into idol worship. At the other gate within the city, the “king’s gate,” where the king would sit among the people and preside. I am sitting on the “king’s seat,” where I always felt destined to be. Dreams come true, y’all. I will be firm, but fair. Town cursed by Jesus (“Woe to you, Chorazin and Bethsaida…!”); only just uncovered in 1986. These are the excavated remains of a house with a wine cellar. Check out the quote on that stone. Wine lovin’ ain’t nothin new. Jesus Boat—this fishing boat was discovered by two brothers when the Sea of Galilee receded a bit. It was dated to the time of Jesus and had been preserved in the mud all these centuries. Through some crazy preservation gymnastics, they were able to save it before it crumbled like rotted wood. That’s Tiberias in the background, a city I loved and can’t remember why. Also, I’m amused at how irritated Pastor Ryan looks. That is a platter of St. Peter’s fish we had for lunch. And that is a giant ham behind it. One exact location that we know for sure Jesus walked. Capernaum was the home base of Jesus’ ministry, and this 4th century synagogue was built directly on top of the 1st century synagogue (remains found underneath). Since Jesus taught in the synagogue, we know he was right. here. This church was built on the excavated remains of Peter’s house (based on a Byzantine-era inscription). I’m enchanted. 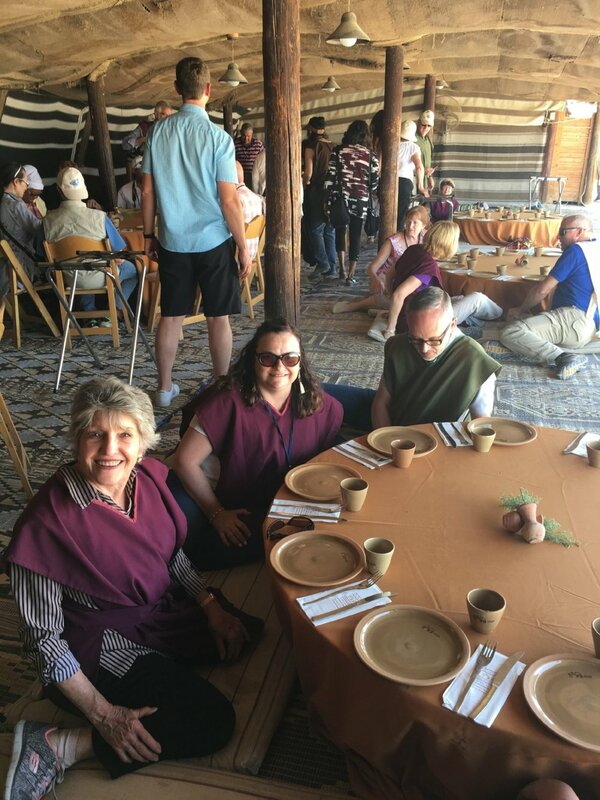 Visited Nazareth Village, a recreation of a farm and village during the 1st century. Our guide shared that people would bury their dead in tombs like this one, then retrieve the bones a year later to put in a family ossuary. In the background is a terraced vineyard they unearthed. Inside an olive press. The olives were crushed into an olive mash by a donkey pulling this stone. Then olive mash is placed in the press—1st press: premium oil used for menorah in Temple; 2nd press: good oil used for food and perfume; 3rd press: low quality oil used for lamps and soaps. Significantly, the Garden of Gethsemane means “Olive Press,” and Jesus prayed 3x and sweated drops of blood. He was being pressed and poured out, like the olives. Olive trees are extremely hardy and can get very old. This tree is over 400 years old. Almost as old as your mom. Area of discovery of Dead Sea Scrolls. A 12-year-old Bedouin shepherd lost a goat one day. He threw a rock into a cave to scare his goat out, and heard the crashing of pottery breaking. Discovers ancient scrolls rolled up in jars, sells them to buyer in Bethlehem for 5 pounds (equal to 5 goats). Eventually they were found to be fragments of every Old Testament book except Esther, and the one completely intact scroll is that of Isaiah. The scrolls are priceless today; at the Shrine of the Book museum, you can only see a replica of the Isaiah scroll. This scroll is 1,000 years older than any previous copy, and is virtually identical to our present version of Isaiah...showing that the Jews were painstaking in copying the sacred texts. Unretouched photo—the colors here are hazy pastel desert gorgeous. Christy, Jan, and I ran down for an evening swim (float). The salinity level of the Dead Sea is around 10x that of the ocean. Nothing lives in it, and you can float! If you swallow 20cc of this water, you’ll die from instant asphyxiation…but being rebellious and/or a diehard foodie, I tasted a wee drop and found it to be aggressively salty. Let me get wordy nerdy here and talk about the language. I’ve learned a smattering of Hebrew over the years, and the Hebrew alphabet just speaks to me. Something about the way the letters are formed. I took this pic because this was the first word (albeit a name) that made more sense to me in Hebrew letters than in English. That felt like a language victory. The desert fortress revamped by Herod around 31 BC. 1477 ft. high. Overlooks the Dead Sea. In 73 AD, Jewish rebels took a stand against the Roman armies at Masada. The Romans built a ramp up to it using Jewish POWs (so the rebels wouldn’t fire on their own brothers). The besieged families, both adults and children, committed mass suicide rather than be taken as prisoners. Look Ma! No trademark infringement! Bethlehem is in the West Bank—Palestinian territory. This is the Nativity Church, the oldest Christian church in the world. Built by Constantine’s mother, Helen, in 323 AD. She was told by townspeople that this cave was where Jesus was born, so she built this church on top of it. 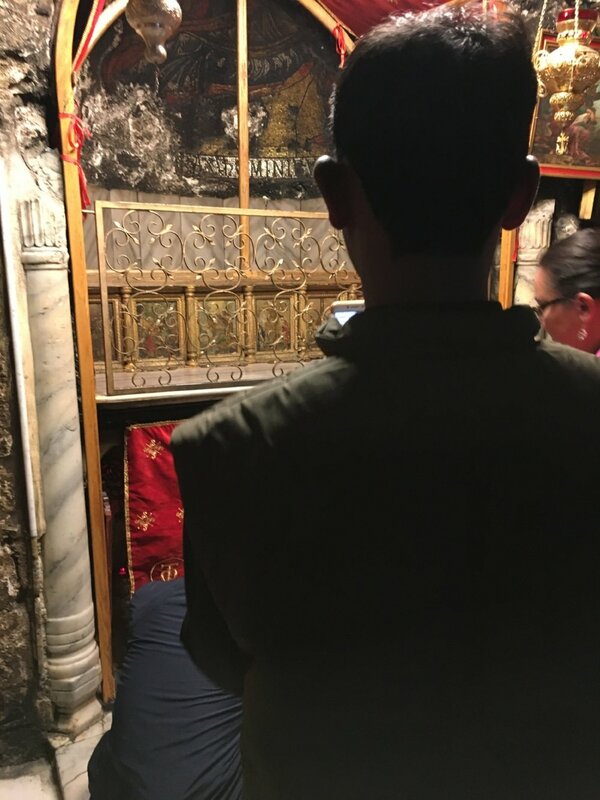 I’m so glad I waited 2 hours in the sweatiest packed crowd of tourists to squeeze into a claustrophobic room to snap this inspiring pic of the shrine where Baby Jesus was born. WORTH IT. Modern, ancient, beautiful, perplexing. Jerusalem, I remember thee well. The Garden Tomb (possible site). This tomb belonged to a wealthy man because it would have cost a lot to have it cut out of the rock like this. And the stone that covered it would have weighed over 4,000 pounds. I liked the point our tour guide made: this is the one spot on earth where all the elements of the Gospel happened—Jesus’ death, burial, and resurrection! Pastor Ryan contemplates life on the Temple steps. Jesus would have taught on these steps, and it could be the site where Peter addressed the crowd during Pentecost. The Second Temple was destroyed by the Romans in 70 AD and never rebuilt. A stretch of the outer wall is all that’s left of the Second Temple. 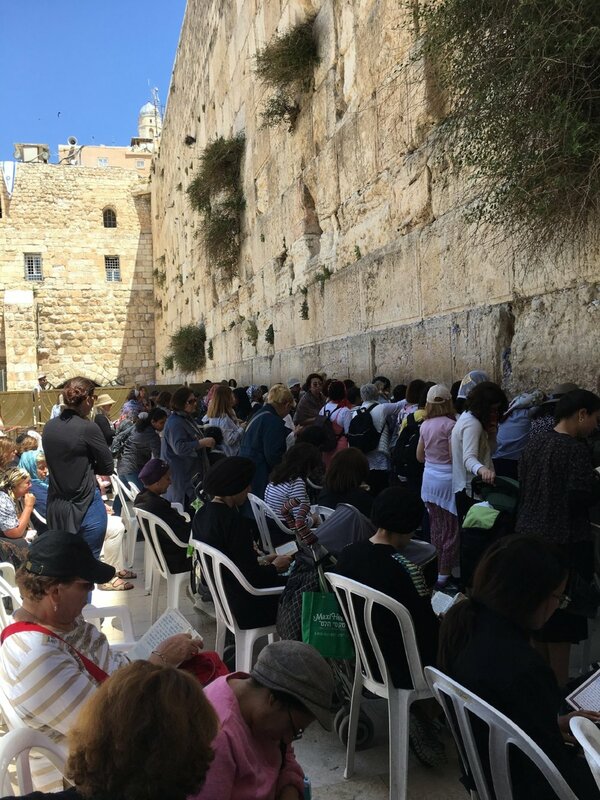 Faithful Jews (and many others) visit the site every day to mourn, pray, and weep. It is called the “Wailing Wall” because of this practice. Nearby is the Temple Mount, the site held to be where Abraham offered Isaac to the Lord, and where the First and Second Temples were built. 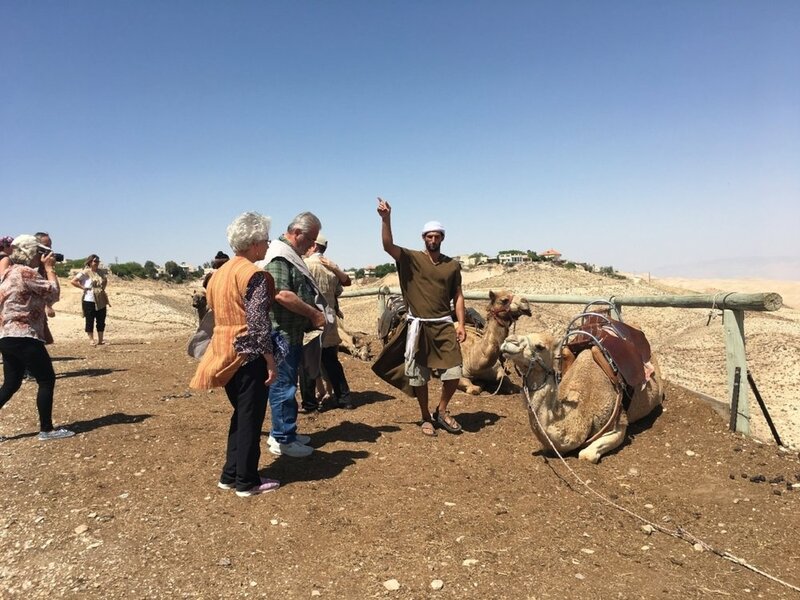 This site is also holy to the Muslims, believed to be where Mohammed ascended into heaven, and the iconic “Dome of the Rock” stands here in commemoration. This one small area represents the intersection of the world’s 3 major religions: Judaism, Islam, and Christianity. Genesis Land, just outside Jerusalem. Set up to demonstrate “the land of Abraham” and the hospitality necessary in the hot desert land. Also, camels. Me 'n’ Janford up on a camel. The song Simon and Garfunkel almost wrote. Ate the best food of the trip here in “Abraham’s Tent.” Hummus with za’atar, fresh pita bread, date-glazed chicken, tabouli salad…now if I could just get an Abraham-sized nap. At every point of interest, someone tries to sell you something. Every. time. This man tries to fit Jan for a “cooling” headscarf out in the hot desert sun. Ended our trip shopping for tchotchkes in the Old City. My tour mates bought stuff and I ambled shiftlessly, dreaming about lunch.